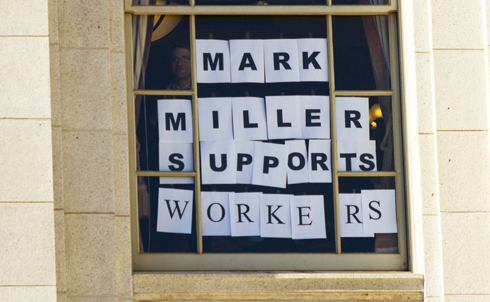 But Wisconsin’s workers are fighting back: demonstrations have exploded across the historically progressive and pro-labor state and are now in their fourth day, with the state’s capital, Madison, the epicenter of the growing backlash to Walker’s anti-worker efforts. 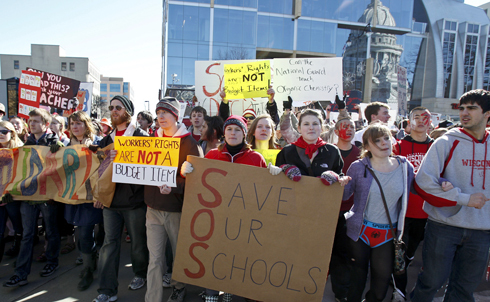 In one of the first actions of the protests, thousands of students, public employees and other Wisconsinites stormed the state’s Capitol building to protest the governor’s bill on Tuesday. Over the last few days the turnout has swelled into the tens of thousands. 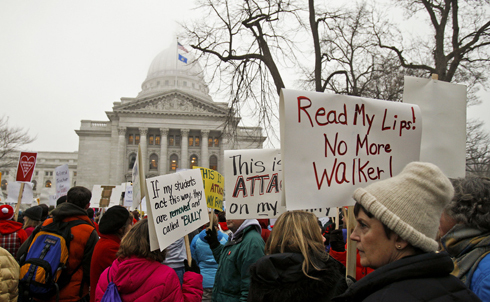 Madison and surrounding area public schools have been closed since Tuesday as teachers call in sick to attend the rallies. The University of Wisconsin–Madison’s Teaching Assistants’ Association TAA called for a “teach out” Thursday, asking for all activity to cease on campus so that the university could stand as unified front against the bill. Students have played a central role in organizing, including a sleep-in at the State Capitol building for the last two nights and walk-outs on campuses and high schools across the state. In a bizarre move, Walker notified the National Guard to be on alert for actions taken by unsatisfied state, county and municipal employees. The state of Wisconsin hasn’t called in the National Guard since 1886. 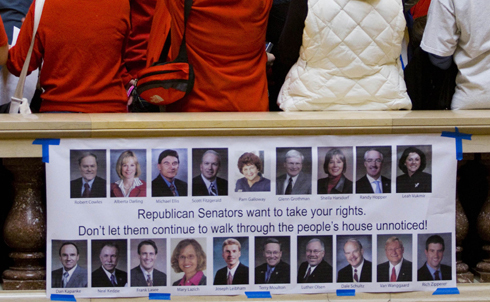 Democratic members of the Wisconsin State Senate walked out of the Capitol on Thursday to boycott the bill, which the state’s Republicans are trying to push through before opposition becomes too fierce. This robbed the Republicans of the majority quorum necessary to call a vote, stalling any action on the bill. “If anybody didn’t know this was coming,” Walker proclaimed yesterday, “they’ve been asleep for two years.” But Walker hadn’t mentioned his plan to dismantle the collective bargaining process during his campaign, and had actually promised to work across lines of partisanship and ideology to create jobs. 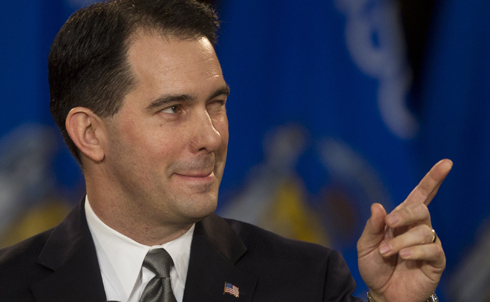 According to recent polls, Wisconsinites overwhelmingly oppose Walker’s bill. 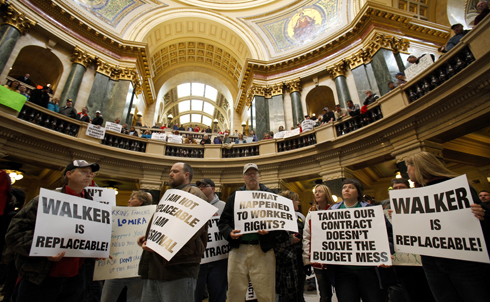 Wisconsin isn’t alone: conservatives emboldened by November’s election results have launched what they hope will be their final offensive against America’s unions, Jane McAlevey writes in this week’s issue of The Nation. 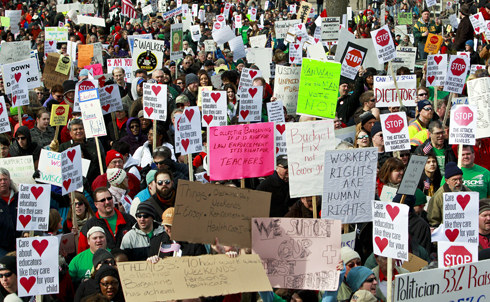 Government workers face attacks in every state. 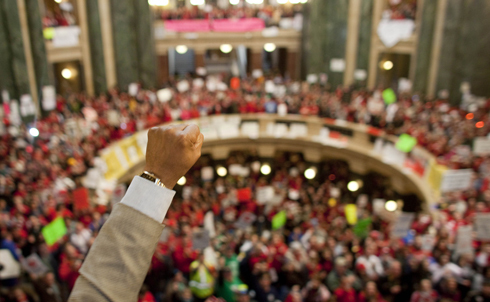 Ohio, South Dakota, Colorado, Michigan, Nebraska, New Hampshire and Oklahoma are also considering collective bargaining for public sector workers, and if Walker is successful, other states are expected to follow suit. 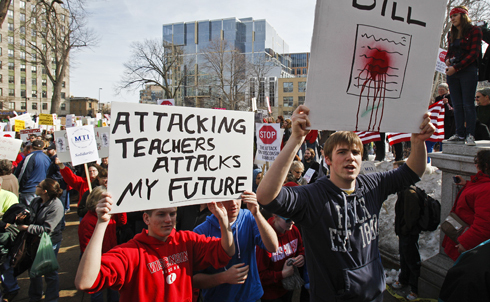 The fight in Wisconsin could be coming to your state soon. 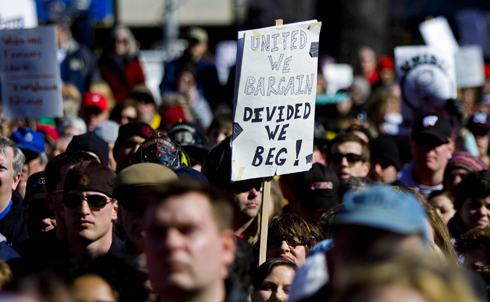 Stop the right’s attack on unions in its tracks by joining Wisconsin demonstrators in a virtual march. The signatures will be delivered to Democratic leaders in the target states. And if you’re a Wisconsin voter you can sign this petition pledging to support a recall of any and all State Senators supporting Walker’s bill. 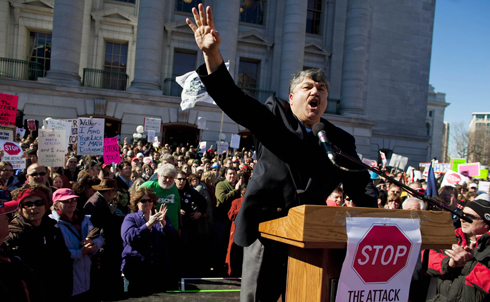 With Jesse Jackson and AFL-CIO President Richard Trumka making appearances in Madison today, the protests are expected to grow through the weekend. Check back at TheNation.com for updates.